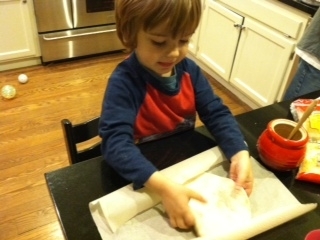 Making pizza provides a fabulous kid friendly activity and meal. It’s amazing how many vegetables I can get Bobby to eat just by offering them as pizza toppings. He likes piling them on his little pizza. And, then when it’s all baked, he’s so proud and happy to gobble up his creation. To be honest, it took me a long time to find a good pizza dough recipe. In the process, I made many a pizza dough Frisbee, that ended up being tossed into the trash. To save you that trouble, here’s my “go to” pizza dough recipe adapted from Alice Waters, the Art of Simple Food. The dough even freezes well! So, make a batch and freeze half of it. Stir together yeast and warm water until yeast is dissolved. Add 1/2 cup flour and stir well. Allow the mixture to sit until bubbly (30 minutes). Add flour, salt, cold water and olive oil. Mix thoroughly. I use a KitchenAid Stand mixer with a dough hook. Knead on low until the dough is soft and elastic, about 5 minutes. If the dough is too wet and sticky, add more flour, but only enough to form a soft, slightly sticky dough. The dough is the right texture when it pulls away from the sides of the bowl of the mixer, but still adheres to the bottom. Put the dough in a large bowl, cover, and let rise in a warm place until doubled in size, about 2 hours. For an even better-tasting and more supple dough, let the dough rise overnight in the refrigerator. Remove from the fridge 2 hours before shaping. Divide the dough into balls. Allow the dough balls to rest at room temperature, for an hour or so. Shape pizza dough on Parchment Paper. Shape into desired shapes. If doing fogaccia, you can make it into rectangles. For a thicker dough, let the shaped pieces sit for about an hour before baking. Brush with olive oil and garlic. Top with desired sauces and toppings. My favorite is brushed with a salted garlic oil, then top with prosciutto, pears, white cheese and fresh herbs. Bobby’s favorite is brushed with garlic olive oil, then topped with marinara sauce, veggies (mushrooms, zucchini & broccoli), and sausage. Preheat the oven (and a baking stone if you have it) to its maximum. Preheat for about a half hour. Put in pizza and turn down oven to 400. Bake for about twenty minutes. Let it cool for 5 to 10 minutes. Enjoy! This entry was posted in food, Uncategorized and tagged Alice Waters, babyfood, cooking with kids, cultivating baby's tastes, toddler recipe, toddler veggies on March 6, 2013 by Modern Mama. Winter in Sonoma means rainy weather, cozy fires and warm stew. 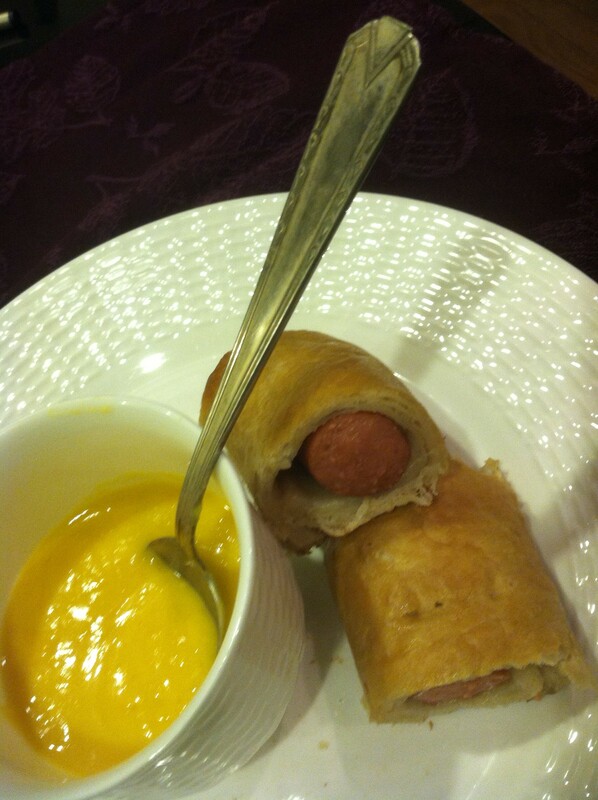 Having 2 young boys around makes finding a dish that all will enjoy challenging at times. This stew though is a winner. With Bobby loving the veggies and CJ the meat, this dish is both baby and toddler friendly. The deep flavor imbued by the red wine (I use cab) makes it adult friendly too. Plus this recipe yields quite a bit of stew so it is a perfect excuse to invite over a few friends to share it with. Heat pan, add oil and bacon fat, heat till smokes. Brown meat. Add mushrooms, potatoes, onions, broth, wine, tomato paste, spices (parsley, thyme, salt and pepper). Cook on low in slow cooker for 7.5 hours. Toss the bouquet. Thicken sauce to desired thickness with flour. Add kale. Let kale wilt. Serve with rice. Enjoy! This entry was posted in food, recipe, sonoma and tagged baby food, recipe, sonoma, toddler recipe, toddler veggies on December 5, 2012 by Modern Mama. Within the last few months Bobby’s imagination has bloomed! The other day we made these treats for breakfast and he decided to call to call them treasure chests. When he bit into them, he found a special surprise. If you’ve been reading my blog, you’ll probably guess what that ingredient is – chocolate. You might think I’m nuts to give my tot chocolate for breakfast, and maybe I am, but when the chocolate is surrounded by sweet potatoes, whole wheat and bananas, it seems a bit healthier. Set your oven on 400. Prepare your cookie sheets. I just line mine with parchment paper. While the oven preheats, make your dough. You can make these scones in either a food processor, stand mixer or by hand. Peel and cook your sweet potato. I cooked it in the microwave for 4 minutes. Then, blend the sweet potato and banana in a food processor. Add the butter. Blend well. Then add the liquids, milk, egg and vanilla. Add the flour, sugar, salt and baking powder. Blend. Add the chocolate chips. This dough is super sticky. So, using two tablespoons just drop bits of dough on the sheet. Brush the dough balls with milk and sprinkle with sugar. Bake for 17 minutes or until you insert a toothpick and it comes out clean. Let your little one marvel at the chocolate chip treasures that await within the baked goodness! This entry was posted in food, recipe, tips, Uncategorized and tagged children, cooking with kids, tips, toddler food, toddler recipe, toddler veggies on July 30, 2012 by Modern Mama.